Watch the Lyric Video for First Aid Kit's Bittersweet New Single, "Fireworks"
First Aid Kit are seeing “Fireworks” on their new single, released today along with a lyric video. The Swedish folk-rock duo’s fourth album Ruins is due out on Jan. 19, 2018 via Columbia, making for one of our most anticipated releases of 2018, let alone the immediate future. We’re so excited to finally share “Fireworks.” It’s a track that we put a lot of emotions into. We love the arrangement we created for it with our producer Tucker Martine, borrowing from classic ‘50s ballads and mixing it with Twin Peaks guitars and synths. It’s a song about the ideals you set for yourself in life and how they can break you down, leaving you all alone at the end. 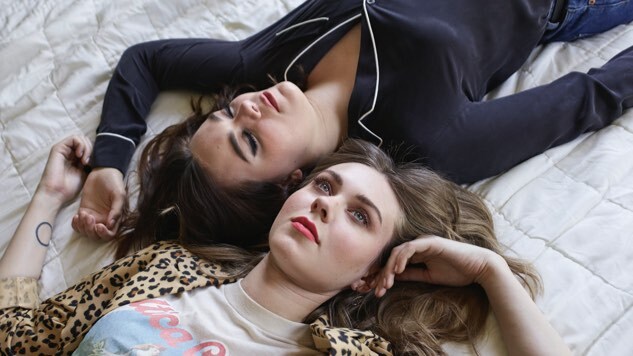 “Fireworks” is the third single from First Aid Kit’s forthcoming album, following “It’s A Shame” (which previously received the music video treatment) and “Postcard,” released alongside the album’s announcement in late October. Ruins is their follow-up to 2014’s acclaimed Stay Gold. The duo also shared a one-off charity single called “You Are the Problem Here” on International Women’s Day last spring, which won’t appear on their new album. Fireworks are an apt image to place at the center of their latest song, a bittersweet tribute to the dazzling but all too fleeting nature of love and life. “I could have sworn I saw fireworks,” it begins, only to come back down in the chorus: “Why do I do this to myself? / Every time, I know the way it ends.” Despite its romantic resignation, “Fireworks” is another gorgeous glimpse of First Aid Kit’s new record. “Buy it, stream it, karaoke along to the lyric video!” the band urged in a tweet. First Aid Kit will embark on a North American headlining tour in early 2018, taking the stage at a number of impressive venues. They’ll start things off at Oakland’s Fox Theatre on Jan. 24, stop off at Nashville’s Ryman Auditorium on Feb. 1 and continue on until a Feb. 13 stop at New York City’s Beacon Theatre. Van William will provide support for most of the 14-date tour. Tickets are on sale now—more info here. Watch the “Fireworks” lyric video below, plus a 2012 First Aid Kit performance from the Paste Cloud, and find the band’s tour dates further down. You can preorder Ruins here.